There are many misnomers about what Reformed Theology is and isn’t. One thing to get out of the way is that Calvinism isn’t all that being Reformed is about. Many people use the words “Calvinism” and “Reformed” interchangeably, to mean a belief in the doctrines of grace. The word “Calvinism” comes from the Reformer John Calvin, who was the first to outline the doctrines of grace. Today, we use the acronym TULIP to outline the five main points of the doctrines of grace. So it basically boils down to mean that someone who is a “Calvinist” holds to “TULIP”, a.k.a. the doctrines of grace. When you step into Reformed theology, it is belief in the doctrines of grace as listed in the TULIP acronym, but it is much, much more. For example, you can attend a “Calvinistic” church that holds to the doctrines of grace, but if it’s faith statement mainly only covers those points, without the confessions and catechisms, (more on that below), then it cannot be called Reformed. In my studies on theology and becoming friends with many ladies who attend Reformed churches, I made a list as I was learning. It might not cover absolutely every distinguishing aspect of Reformed theology and what a truly Reformed church looks like, but it is a fairly exhaustive list. So this is how being Reformed or a Reformed church differs from a “Calvinistic” church, being a “Calvinist,” or other evangelical branches of Christianity. Holds to the five points of “Calvinism” or the Doctrines of Grace, along with the Five Solas. Understands and believes in Covenant Theology. (Not Dispensational.) Listen to this Theology Gals podcast: “Covenant Theology” to get an idea what this means. Eschatology (end times beliefs) are usually either amillennial or historic post-millennial. They practice keeping the Sabbath. Worship style follows the regulative principle, not the normative principle. Listen to this Theology Gals podcast on the subject: “Regulative Principle of Worship,” for more information. The church government is set up to include elders and sometimes deacons. They are usually divided geographically into presbyteries or synods. The expectation is that church is where believers meet to worship and learn and disciple. (As opposed to the “seeker sensitive” churches where there could be half a sanctuary filled with unbelievers on any given weekend.) They have church membership. The churches also actively practice church discipline as outlined in the Bible. The sacraments of the Lord’s Supper are to be taken only by believers, and even then, done with such reverence that they have first examined their own hearts. The actual elements of the Lord’s Supper are not thought to be miraculously transformed into the actual body and blood of Jesus as the Roman Catholics practice, and they are not thought to somehow contain the presence of Jesus, such as the Lutherans believe. Rather, they are a memorial, taken in remembrance of Christ’s death and resurrection as atonement for our sins. In historically Reformed churches and even now, they don’t have images of Jesus anywhere. There are no pictures, statues, or stained glass bearing any likeness to Jesus. Many Reformed people stay away from movies and TV shows that depict Jesus, such as The Passion. (This belief is from the second of the Ten Commandments, which are held in highest regard.) Listen to Theology Gals podcast, “The Second Commandment & Pictures of Jesus,” for more discussion on this topic. There is a podcast episode of Theology Gals called, “What Does It Mean to be Reformed?” and another one on “Calvinism” that are helpful in distinguishing what these terms really mean. 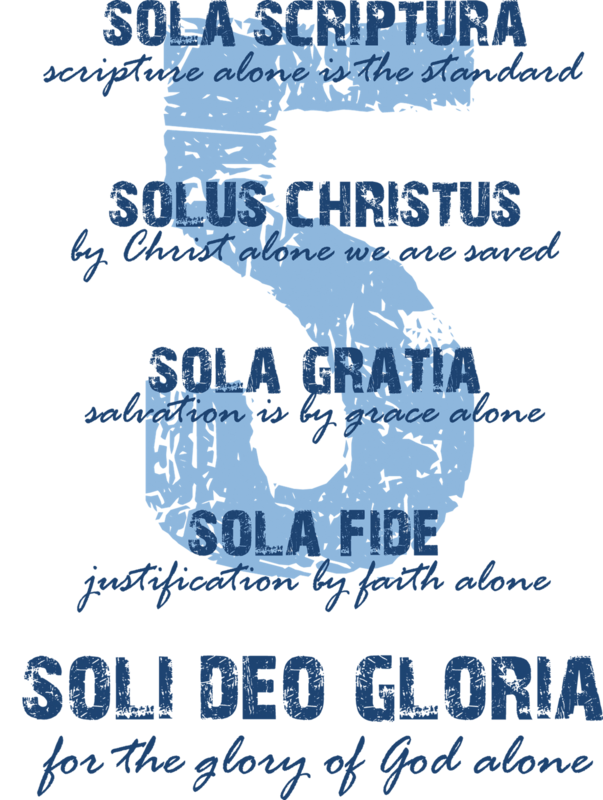 – Affirm the great “sola’s” (Latin for “only”) of the Reformation. To summarize, salvation by Grace Alone, through Faith Alone, in Christ Alone, according to the Scriptures Alone, to the Glory of God Alone. – Affirm and promote a profoundly high view of the supremacy and sovereignty of God in all things and sees God as actively involved in His creation, governing and overseeing all the affairs of men. cf. Psalm 115:3; Job 34:14-15; 37:6-13; Daniel 4:35. – Affirm the utter dependence of sinful man, upon God, in all things, especially concerning salvation. – Affirm the Doctrines of Grace (commonly referred to as Calvinism), which display God as the author of salvation from beginning to end. – Creedal – To affirm the great creeds of the historic, orthodox church. – Confessional – To affirm one, or more, of the great confessions of the historic orthodox church. – Covenantal – To affirm the great covenants of Scripture and see those covenants as the means by which God interacts with and accomplishes His purposes in His creation, with mankind. The Scriptures contain numerous examples of God “covenanting” with man, establishing and ordaining a variety of covenants. – A high view of Scripture, in it’s necessity, infallibility, sufficiency and internal consistency, and our dependence upon it to learn what God has revealed about Himself, His commands, and His way of salvation. – A high view of the church in preaching (the exposition and application of God’s Word), the ordinances, discipline, prayer, worship (Regulative Principal), fellowship, and evangelism, all encompassed in the keeping of the Christian Sabbath, commonly called the Lord’s Day. – A distinctly Biblical, Christian worldview that permeates all of life, a life lived in the world, but at the same time, a life not oriented to the world and it’s standards, but oriented to God’s Word. – A clear understanding of the distinction between, and relationship of, Law and Gospel. The 2nd use of the Law and its perfect requirement points us to the Gospel (good news) of the purchased redemption and free grace of the Son, for God’s people, and the Gospel, once applied by the Holy Spirit, then points us back to the third use of the Law in delight to obey its commands to the glory of God as a new creation in Christ Jesus. There are people like me, who when we find the Doctrines of Grace, we embrace them. We feel like these things are clearly seen in the Bible, but had never encountered a church that addressed them. I do hold to these points personally – the doctrines of grace, the Westminster Standards, the Three Forms of Unity, the Creeds, Covenant Theology, Amillenialism, and cessationism. I am a confessional Reformed Christian. My family moved in the summer of 2018, to an area that has many Reformed church options within a half-hour drive. We have been attending a Presbyterian Church in America (PCA) since August, 2018. As a small child, my family attended an old country Methodist church. I have very fond memories of sitting in the service with my family. I was baptized as an infant there. I memorized the Lord’s Prayer by being in the congregation, reciting it each week. The worship style was simple with a piano and a hymnal. I memorized the Doxology, (Praise God, from Whom all blessings flow; Praise Him, all creatures here below; Praise Him above, ye heavenly host; Praise Father, Son, and Holy Ghost. Amen. ), and several hymns. I remember the cold, hard pew benches and the creaking of old wood. I remember the air of reverence and the feeling of true worship. The sermons, though I don’t remember a specific one, were full of the gospel message. Through the hymns and preaching, both God’s love and His wrath, both God’s goodness and His justice were conveyed. Now I wish to go back to something like that. I’ve had enough of the full band with lights and fog machines, the squishy chairs, the man-cenetered songs and sermons, and the whipping up of emotions in some sort of crazy worship. I long for the old historical church to gather as believers to worship and grow, not to where evangelicalism and the mega-church has taken us. I thank God that my children now get a solid church experience like I did. My point being that for all the ways modern churches have tried to “become appealing” to the masses, the ways they’ve divorced theology, creeds, confessions, and traditions, and the things they’ve done to be “better” has morphed it into something that is undesirable to me. At one time, I would have rejected Reformed theology and a Reformed church. I would have called them legalistic and restrictive and no fun. (But legalism is following man-made rules. Reformed theology is not man-made. It is based upon a literal and high view of Scripture. God, in His Word, tells us how to worship. We follow what God has said without adding to it.) It’s not restrictive, but rather more freeing. And I find it fun to read the Bible, study theology, and sing hymns. I joke that when we moved to New England, I became a Puritan (at heart)! As of 2018, we have moved back to our home state and are Reformed and always Reforming! I hope that gives a more clear explanation of what being Reformed really means.